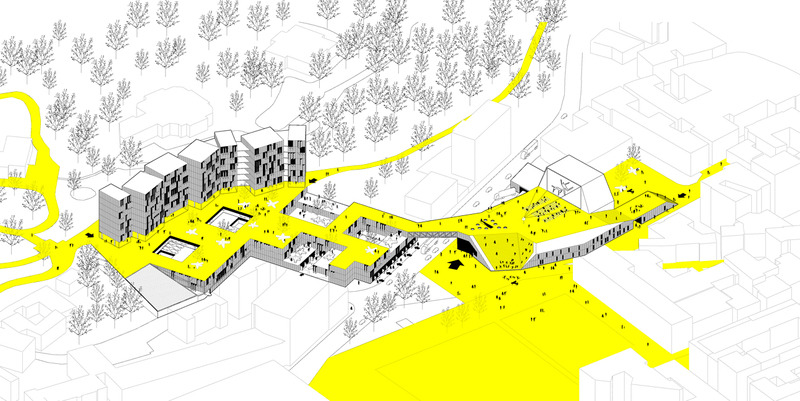 The intervention proposed in this international competition for this sensitive site in the city of Varese is an extraordinary opportunity to discover the hidden necessities of users, program and place. We should not only give a functional answer to the defined program but also to create an added value to make a better city, based on the continuity of the public spaces as a social infrastructure. We propose to listen to the memory of the place and highlight its potential as a public area, connecting the existing spaces such as the Piazza della Repubblica, with the Bosto Hill behind. 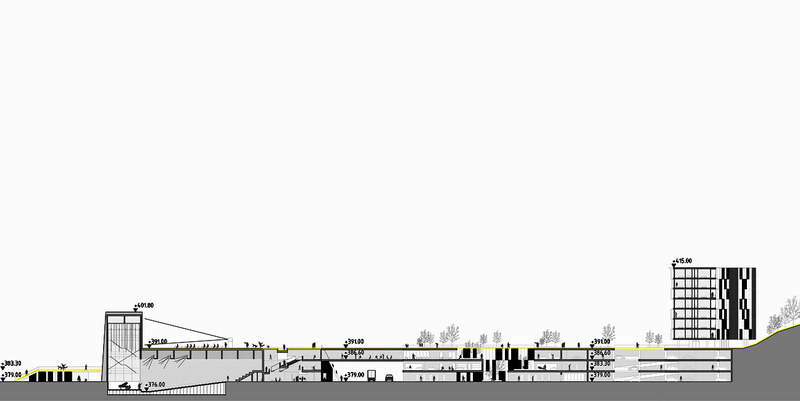 The different levels of those extrems of the site give the possibility to use the new program as a public connection through the rooftop in a natural flow from the hill to the city below following different routings and possible open air uses. It will be also a comfortable way to go from the lower part up to the Bosto Hill through public spaces with views and avoiding the traffic. Following the roof top to the south we cross over the restaurant bridge and we get to the platform over the offices, health center and commercial area that connects with the Bosto Hill and gives basement for the placement of the 8.500 m2 of dwellings. The new primarily residential building is placed along the Via Giardini, and is organized in housing units with double orientation to enjoy the views and sun both to the Bosto Hill, and to the Piazza della Repubblica. Those dwellings lean on top of the three-storey parking and are directly linked with it by lifts and stairs with independent access from the street. 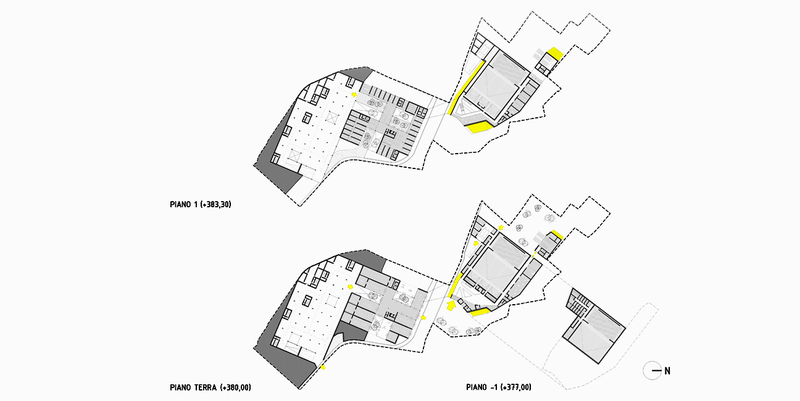 The parking is placed mainly underground under the dwellings and with direct connection to the rest of the program at each floor. IT has some openings for natural light and ventilation. It is placed on the second floor it enjoys different orientations, views and open-air terraces. On the third level with an exterior terrace and direct connection to the cafeteria and restaurant, facing the Piazza della Repubblica. The street level below is reserved for the commercial spaces as we expect more people to come from that level. The cafeteria and restaurant becomes a bridge that connects the theater with the rest of the project. The most representative piece of the hybrid program is the New Apollonio Theater that focuses its configuration on a functional and neat rectangular plan to provide good acoustic properties and appropriate views for all the 1.500 spectators expected. The rest of the program embraces this functional auditorium and adapts its shape to the urban context, both in plan and section. The scene sinks three meters in the ground to host the auditorium and not exceed the height level of the three-storey building proposed on the other side of the street. The Theater isolates the services areas on the south west side next to Via Giulio Bizzozero, and the scene. The dressing rooms are placed below in direct connection with the scene level. 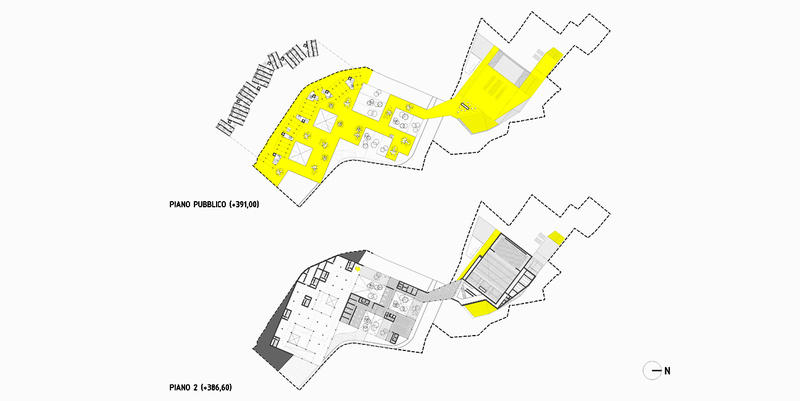 The rest of the uses (rehearsal spaces, administrative spaces and multipurpose space) are around the auditorium and the foyer that becomes a big interior void in relation with the roof top. This space is directly connected to the theater but allows the pedestrians to cross. It can be used as an interior facility, and can be opened to the courtyard to extend it during good weather conditions. The Theater foyer is accessible from a open space created in front of the access to the theater to give importance to it, and to host comfortably the coming spectators for any event. The Theater is not only the expected facility but also a collection of open-air possibilities that enrich the use of this area of the city. The rooftop becomes a high “piazza”, for any sort of activity such as a summer open-air cinema. The rooftop is linked with the city alsothrough an open-air tribune that creates a big auditorium facing the Piazza della Repubblica, and respects the geometry of the diagonal street, Via Dazzio Vechio. The introduction of this program in the city is the opportunity to offer an added value to the city without an extra cost. If we can use the roofs of the new buildings we can extend the public infrastructures and regenerate the city.